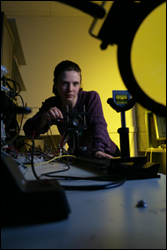 Assistant Professor Pamela Abshire (ECE/ISR) is the principal investigator for a new National Science Foundation award for "Integrated Transduction, Actuation, and Control for Cell-Based Sensing." Assistant Professor Benjamin Shapiro (AE/ISR) and Associate Professor Elisabeth Smela (ME) are the co-principal investigators for this award. The researchers will be developing and demonstrating enabling technology for cell-based sensing, which has a potential for selectivity, sensitivity and speed that far exceeds current chemical and biological sensors. In addition to olfactory sensing and pathogen detection for national security, this technology has applications in health care, pharmaceutical development and environmental monitoring. The researchers' integrated transduction-actuation-control approach also could have an impact on labs-on-a-chip, microfluidics, and nanotechnology by developing basic technology and techniques for sophisticated manipulation of particles at the micro-scale.